This is a beautiful, gentle, children’s book, set in Paris during the occupation by Nazi troops. If it sounds like an oxymoron to have gentle and wartime together, it’s not. 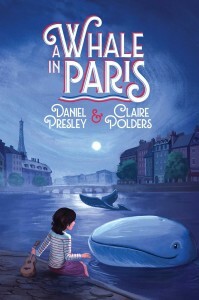 The authors have managed to make a dire time very vivid, at the same time that they offer a fanciful possibility – a whale in the Seine. While people are starving, they are also holding on to hope. I find this children’s book genuinely uplifting. What it does, without moralizing or overemphasizing the suffering, is demonstrate the depth and power of the human spirit to survive, overcome, and resist. What better inspiration for children of all ages. The writing in this children’s book is particularly simple and lovely. Perhaps it is because the authors are both sensitive to other languages and cultures. At the same time, the vivid writing has a powerful effect. For example, we read about the deprivation of food that the people in Paris underwent during the occupation. As I was reading about it, and how Chantal and her father made the best of it, I was eating my breakfast. Suddenly, I became very aware that I was about to leave food on my plate, uneaten. The thought of how every morsel of food was life-giving made me pause, put the book down, and eat every single grain of rice that was left. There is no question that the plot is far-fetched – a little girl riding a whale out to the English Channel, speaking to it, saving people. But that’s not the point. The story is a counterpoint to the horrors surrounding war, and lets you remember that as much as horrible things can happen, so can wonderous ones. I love this children’s book, and I hope it finds its way to many hearts.